The Tanglewood music festival is over for another year. 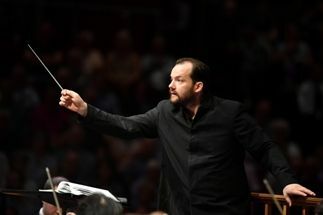 The reenergised and magnificent Boston Symphony Orchestra, under dynamic young Music Director Andris Nelsons, has flown its summer nest deep in the Berkshire mountains of New England to embark on an eight-city European tour: first stop London, and a welcome return to the Proms. The Sunday afternoon concert, Mahler’s Symphony No.3 (Prom 67), followed by Monday night’s programme which included Shostakovich’s Symphony No:4 (Prom 69), continued the orchestra’s year-long homage to Leonard Bernstein, who championed both these composers. This was not the only reason behind the decision to pair these two, mighty works. Shostakovich revered Mahler, and was inspired and influenced by him. While the musical and emotional terrain covered by these pieces is worlds apart, there are some unmistakably Mahlerian references to be found in the Shostakovich symphony beyond its length, size and range of orchestration. In his exuberant, six movement Third Symphony, based upon the writings of the philosopher Friedrich Nietzsche, Mahler, utilising the forces of a vast orchestra and two choirs, sought to embrace the entire world of nature in all its fullness. There are a handful of conductors active today who have the interpretive skill to impose the necessary structure required to reconcile the alternating themes and balance the sounds of the massive first movement. Nelsons is amongst them. Alternately leaning back on the railings of the rostrum, or craning his body forwards with his arms spanned wide – think Antony Gormley’s Angel of the North – Nelsons appeared to scoop up, spread out and modulate the sound. Expressive hands and fingers, sometimes holding the baton, but often without, plucked out the fine threads from solo or groups of instrumentalists within the orchestra, and wove them into an overarching whole. The first movement’s opening brass salvo heralding the primal forces of nature, ‘Pan awakes’, was originally described by the composer as “Summer marches in”. It is followed by a dark secondary theme interpolated with a cheery Austrian march. Nelsons avoided the temptation to take these passages too loudly, and by exercising restraint, succeeded in increasing the tension. In the exposed solo passages, Nelsons eased the reins to permit individual soloists, particularly the principal trombone (Toby Oft), an unequalled freedom to demonstrate his considerable talents. After a two-minute pause for silent contemplation, Nelsons embarked on the sensuous second movement, a delicately orchestrated Tyrolian stroll, replete with a grotesque yet graceful minuet, which Mahler originally entitled “Flowers of the Meadow”. The third movement, an elegiac scherzo in which the BSO’s resonant strings were momentarily hushed by a distant post horn, featured a stand-out off-stage performance by Thomas Rolfs. In the fourth, the velvet voiced American mezzo Susan Graham sang Mahler’s spectral ‘Mitternacht’ from Nietzsche’s Also sprach Zarathustra with great intensity and tenderness. In the sharply contrasting fifth movement, the bright sound of bells and a percussive “Bimm, bamm” from the assembled voices of the children’s chorus were coupled with songs adapted from Des Knaben Wunderhorn beautifully sung by the women’s choir. Both groups instilled a sense of innocence and wonderment in equal measure. Nelsons’ eloquent account of the majestic finale “What God tells me” captured the spirituality of Mahler’s lakes and mountains, and brought the afternoon to a poignant and exultant conclusion. After the rich offering afforded by Sunday’s programme, the BSO’s second concert started with a rather thin gruel. Bernstein’s Serenade (after Plato’s ‘Symposium’), his Stravinsky-like neo classical style violin concerto, was played on this occasion by the Latvian Baiba Skride. The inclusion of a Bernstein work in the BSO’s concert repertoire has become a ubiquitous programming feature in the centenary year of his birth; perhaps too frequent for a composer of inconsistent quality. It has perhaps left some feeling somewhat ‘Bernsteined out’. Skride, technically impeccable, as always, captured the work’s cool classicism, and the paired down orchestra – just strings, harp and a reduced percussion section – provided a measured accompaniment. One could perhaps detect just a hint of Shostakovich in beautifully melodious fourth movement, an adagio entitled ‘Agathon’s Song’. Nelson’s restraining hand only relaxed in the fifth movement, allowing the players to indulge in the only Broadway show moment – a syncopated and jazzy allegro. One was left feeling that this small island of a piece was simply engulfed by the vastness of the Royal Albert Hall, and certainly outclassed by what was to come in the concert’s second half. In his huge Symphony No. 4, requiring an orchestra of 125 players, Shostakovich gives us a vast continent of sound – a bleak and uncompromising musical landscape. The shockingly shrill and dissonant opening of the lengthy (35 minutes) first movement breaks into a grim march – a deathly cold struggle for survival. The mournful voice of the bassoon which follows, hauntingly depicted by principal Richard Svoboda, is soon ruptured by disquieting blasts from horns, trombones and machine gun interjections from the xylophone (Kyle Brightwell is just one member of the BSO’s percussion section who should be singled out for mention in dispatches). Mocking woodwinds provoked a furious response from the serried ranks of BSO brass, and the strings inflicted the first movement’s stinging string fugue with appropriate fury. The symphony’s eerily quiet middle movement was chillingly conveyed by weeping violins and plaintive cries from the woodwind, ending with the ominous tick toc on the woodblock, a reminder that in times of terror, every minute of life seems like an hour. The finale – a dark Mahlerian funeral march – ended with the softest chimes of the celesta and call of a distant trumpet. Nelsons and his orchestra had safely led us through a tumultuous journey, but left us standing at the cliff edge of despair.